One of our Sunday table from the Tandle Hill Tavern has died. We knew it was coming and so did he. Yesterday after his funeral we met, not at the Tavern, but at the nearby Ship, thus allowing the landlord of the THT to join us to see the lad off in a style he'd have liked. We had a piss up. It just wouldn't have been the same or befitting in a house or hotel function room. He was a pub man and only the pub would do. Funerals are big business for pubs in this area and, I suppose in others. It's an ill wind that blows nobody any good. Do We Like That One? I'm not a drinker of own brand beers really. I kind of think they are likely to be not very good with one or two exceptions. These exceptions are usually where a very good brewery has been commissioned to produce a particular kind of beer as part of a range. But what about those low end "cooking lagers" which aren't brands, but are set up to compete with "brands"? The nice people at Aldi sent me some beers for me to find out for myself. A pretty unusual task for this writer, but I thought it might be fun and that I might learn something. Now I'm a fan of Aldi. I like many of their things, though like all supermarkets, you have to pick and choose. 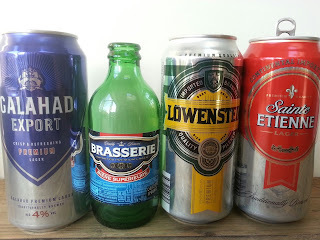 I have bought beer from them in the past, more of which later, but not their canned offerings, competing with the big boys on taste and bettering them on price. On a sunny Saturday afternoon, me and E decided to give them a whirl. I set them out in order of strength and one at a time, off we went. First up was Galahad Lager. "Crisp and Refreshing" is the claim for this four percenter. The beer itself pours a nice clear gold with a lasting white head. E picked out the metallic nose straight away. High carbonation and a thin body followed with a touch of wheat spiciness and a slight lemony taste. The verdict? You could do worse actually and it does what it says on the tin. Crisp and refreshing? Yes indeed. No range it seems these days would be complete without a French 25cl stubby bottle. Brasserie Premium is just such an animal and displays all the usual faults of the breed. All taste and character has been brewed and filtered out to leave a thin, brasso like fizzy liquid. Buy on price only. At 4.5% Lowenstein gives every impression of being brewed in Germany, down to the rheinheitsgebot conformation, but it is brewed yet again in France. All barley this time and you can smell it on the toasty nose, but it is let down by thinness, lack of a hop presence or any depth or body from the malt. Last up is St Etienne which is set to compete with Stella. So brewed in Belgium then? Sorry, no. France again. I read up on this one on the web and it seems it used to be brewed in Belgium, but now isn't. Commentators have noted the tail off in quality. The beer manages to be both sharp and sweet simultaneously. It has a bit of a wet dog nose, no hop presence and sort of dies in your mouth. Pretty horrid really and not as good as the Galahad. E chucked hers into the hedge after a few sips. Now I pointed out above that I used to buy beer from Aldi. That beer was Wernesgruener Pils, a real classy German Pils, alas no longer stocked in the UK. I'd recommend that Aldi find a decent German import again in 33cl bottles, or re-stock Wernesgruener. Branded German beer is cheap as chips to buy and even with UK duty added, well worth the effort. Those of us who aspire to something better would certainly appreciate it. Those that just want a cheap quaffer could do a lot worse than buying the Galahad. 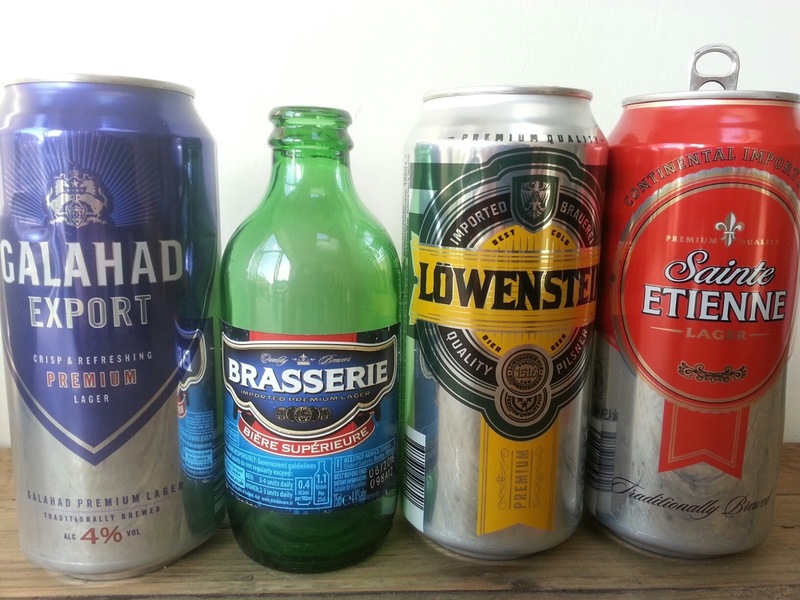 Oh and maybe don't have all your own brand beer brewed down to a price in France. I do know that from time to time Aldi does have branded German lagers in stock, but these tend to be offers in half litres. It was the CAMRA ROB fortieth birthday bash (yet another) last night. This time it was a curry - a ruby for a ruby. Geddit? We assembled for pre-curry drinks at the Regal Moon. My first choice as it always it when I see it on the bar is Hawshead Windermere Pale, full flavoured, hoppy and a mere 3.5%. If there is a better 3.5% beer in the country, I've yet to taste it. * It was a great start to what would be a great evening. Next up was a beer about which much has been written and which at its best is brilliant, but which often disappoints. Jaipur India Pale Ale. Now I tend to try Jaipur when I see it and can say that I usually feel good about it about half the time. I suspect that is little to do with the brewer and a lot to do with pubs serving it before it is really ready. I have a habit of texting @ThornbridgeDom with reports, but last night I was too busy enjoying the occasion to do so. It was Jaipur at its best. Clear as a bell, precise flavours and surprising drinkability for its 5.9% strength. I bashed two down. When we repaired to the brilliant Asia Curry House in Rochdale, there was little by way of choice, so I drank Cobra as you do in such places. Actually once it had lost a little of its intense carbonation, it wasn't a bad drink at all, and it gave the shiraz I also had a good run for its money as a curry washer downer. So there you have it. Three pale beers and each holding its own in its own way. Beer. You just can't beat it can you? *Actually there is another 3.5% beer even better though harder to come by. It is Iti an all New Zealand hopped beer from, well you might have guessed, the brilliant Hawkshead. Brewing beer from water, malt, yeast and hops still works best and will never go out of fashion. I read in Jeff Bell's blog that Kernel are ceasing to be part of the Bermonsey Beer Mile, as they cannot cope with the hordes that descend on them, though they are continuing to sell their bottles directly from the brewery. Not surprising as the whole Bermonsey Beer Mile thing has got out of hand. When we used to go - and it is convenient for us so we went quite often at the beginning - but latterly we missed out Kernel as it was always packed and anyway, their expensive murky bottles and draft don't hugely appeal to me, or indeed, E. Nor it seems to some of Jeff's commenters, one of whom describes their customers as "imbeciles". Nowadays we stick to Southwark Brewing at one end and Fourpure at the other. It makes more sense just to enjoy the walk between the two and neither rip you off on price, or sell you beer that looks like electric soup. Kernel are seeking another solution for on sales. Not surprising really as it must be quite lucrative for them and hard cash is always difficult to replace. Ironically this comes as the Piccadilly Beer Mile in Manchester officially becomes a thing. I was out in Manchester on Saturday night. Unusual for me. An American mate of mine was in town with his girlfriend, so I made my way across town to the Knott Bar, a place I know, but due to its distance from my bus route, not one I go to very often. After a few pints, I changed my drink to Magic Rock Rapture. I like their beers but was surprised to find it opaque and muddy, almost like the last pint out of a cask. A barman who hadn't served me noticed me examining it and said "Is that the Magic Rock?" I replied in the affirmative. "Yes" he said, "they've stopped fining their beers and we are getting complaints. I'll change it if you like." I liked, adding that it just didn't taste right at all. Now I don't know whether this change to no longer fining beers is true or not, but I have looked after Magic Rock beers before and they always dropped bright. Has this changed really happened or did I just get a bad pint? Back to the same old problem. The certainty is being swept away. You just don't know any more. Either way, this murky thing has raised its head yet again. The only saving grace was the barman handling the situation with skill and changing my pint happily. That is by no means certain if we see more and more unfined beer served without a warning. My Yankee chum also ordered a bottle of Rochefort 10. It was my round and set me back £7! Readers will probably know I don't like murky beer and since Rob Pickering first coined the term, I've become an avid fan of the descriptor "London Murky", though it equally applies to Manchester - or for that matter, Anywhere Murky. 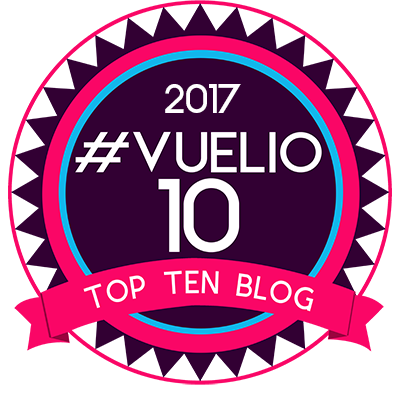 On my return to London from our Spanish holiday, we were both knackered. Handy for our London flat is our local JDW, the Goodman Fields, so we headed along for a quick meal. Our skinny steaks were delicious - surprisingly so perhaps - and the place was rammed. I remember when it opened and for some years after, it used to be empty, so Timbo saw its potential, now clearly fulfilled. 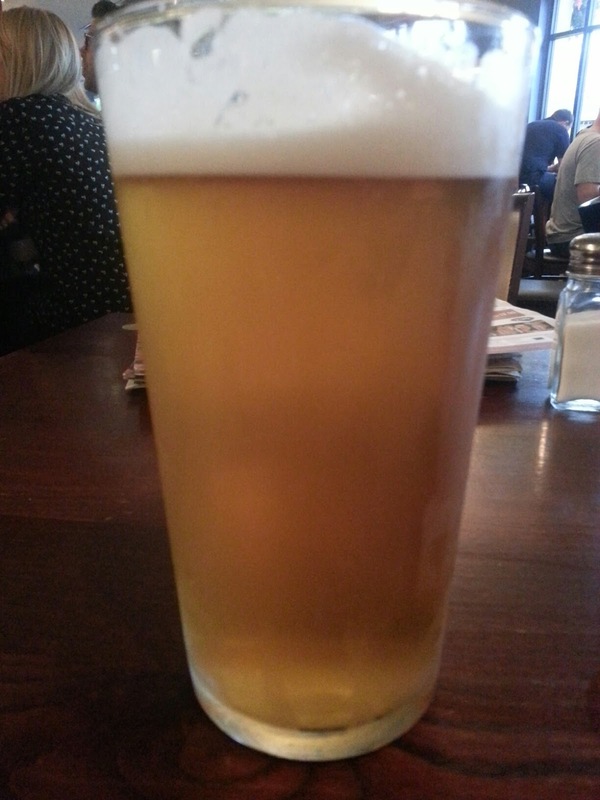 I ordered a pint of By the Horns Stiff Upper Lip, though it isn't a beer I'm at all familiar with. Bloody thing was cloudy. Now here's the problem. How do I know if it is meant to be cloudy, or if it on the other hand, has been slung together by some numpty who doesn't now how to brew beer. Or, possibly, put on too early by a dopey cellarman before it has dropped bright. I don't and can't know of course is the answer. Now you may say "What does that matter if it tastes all right?" Well it won't taste all right to me and it is me that is buying it. It will likely taste of yeast and protein trub, because that's what causes it. Now of course it is a matter of personal taste whether you like this kind of flavour, but I don't. I like clear, clean, precise flavours in my beer. To my mind if brewers wish to sell the unsuspecting public beer, they should at least have the decency to warn us and hence the pubs that sell it, that it might be cloudy (hazy in murkyspeak). Then at least you have a choice. When this first became a "thing" like many I'm sure, I thought to myself, "It won't last", but in fact it has. It has actually become more common, widened and deepened. It is particularly common in London and not only there. It is slowly undermining public confidence in cask beer. It is also very, very depressing. I did get in touch with the brewery who said "It is meant to be fined". They also said something else but that's for another post. 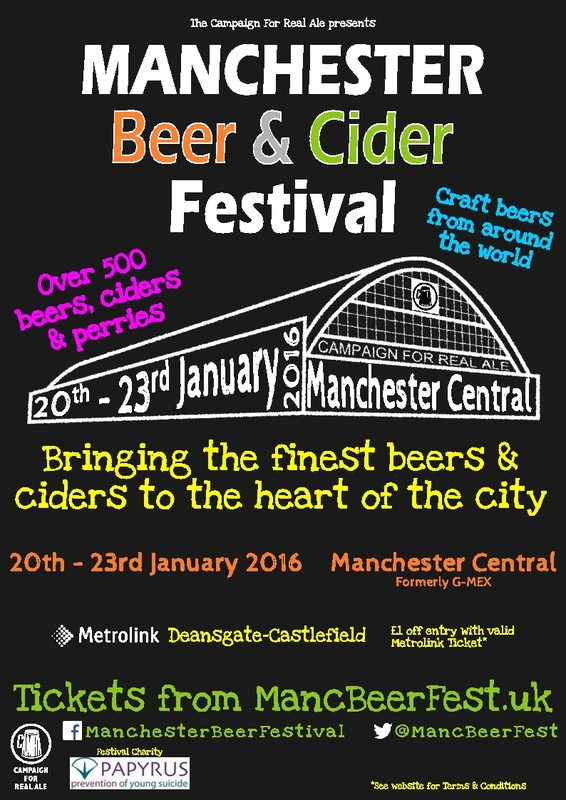 Manchester Beer and Cider Festival 2016 will be at the amazing venue of Manchester Central. 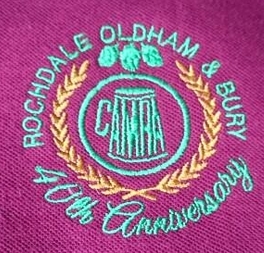 It's been a long haul but after many months of searching, negotiating, rejecting and dismissing, Greater Manchester CAMRA Branches have finally come back to our first choice venue for Manchester Beer and Cider Festival. Since (at the insistence of the main tenants Team GB) we were kicked out of the Velodrome, we have been looking for a new venue. One of the things that many people, even beer festival goers, just don't understand is how difficult it is to find a large venue in a big city at the time, duration of hire that we need and at a price that we can afford. Manchester Central has always been where we wanted to be. Formerly known as GMex, this former railway station, now a huge conference and exhibition centre, has proved elusive, but thanks to some hard negotiations and the fantastic flexibility shown by the venue, agreement has been reached. Now the hard work will really begin as we have a huge space to fill. It's all on one level, bang in the centre of town with bus, tram and rail links right beside it. We can drive our kit straight in, we will have an amazing number of chairs and tables and of course a fantastic selection of beer. I'm not giving away any secrets (I hope) in saying that we are aiming to take full advantage of the recent CAMRA AGM decision on keykeg which allows us to serve cask conditioned beer from those containers. Watch out for a lot of innovation and a lot of new breweries. You really must be there. Six months of meetings and negotiations has seen the organisers secure their first choice venue which will allow them to retain all the features which attracted over 11,000 drinkers to the 2015 festival and is expected to attract even more at its new central home. The festival will feature a massive choice of over 500 beers, ciders and perries across a range of bars. Work is already under way on selecting the beers with established favourites including Marble Beers, Hawkshead Brewery and Brightside Beers already on board alongside relative newcomers to the local beer scene including Cryptic Ales and Seven Brothers. Festival Organiser Graham Donning said "We are very excited to be bringing the festival right into the heart of the city. With direct access from the newly improved Deansgate-Castlefield Metrolink station and Deansgate rail station, we couldn't have a better location for our customers who flock from across the region and indeed from all over the country to attend." When asked about the process of selecting a new venue he added "The last few months have been very busy behind the scenes as we sought the perfect venue. Myself and my colleagues have visited numerous venues across the city and held countless meetings to discuss available dates, logistics, budgets and all the other dull details which the drinkers never see. We are delighted that we have been able to secure an agreement with what was our first choice venue. " 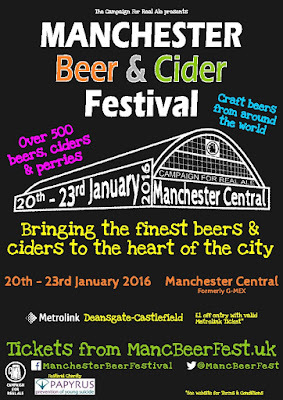 Although only three years old, the Manchester Beer & Cider Festival has established itself as one of the top beer festivals in the UK, with one of the largest ranges of beers and cider. Up to 13,000 visitors are expected to travel from all over the country and beyond to attend the festival which compliments Manchester's growing international reputation as a centre for craft beer. Hundreds of volunteers will spend four days setting up what will become Manchester's largest pub serving over 50,000 pints over the four day event. Oh and I'm Deputy Organiser again, so it's bound to be good. Get the dates in your diaries now and spread the word please. Prices will be very reasonable compared to privately run festivalS and we will have a gobsmacking choice of beer, cider and perry. The Foreign Beer Bars, not mentioned above will be brilliant. Just come along and see, travel to the venue is easy. . While beer may play an increasing part in the lives of the urbanites of large Spanish cities, in the countryside it is more utilitarian than that, being a small drink of a quarter of a litre to have as a quick refresher, or just as an accompaniment to sit with while chatting. 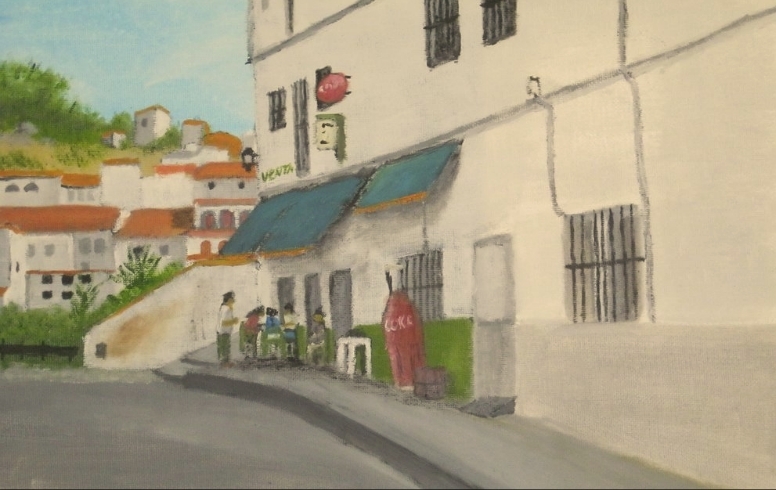 In Gaucin, a white village perched high in the hills above Gibraltar, bottles of (usually) Cruzcampo were the normal drink of choice amongst Spaniards, while us Brits, when asking for a beer, were automatically given draft in thirds or half litres. We didn't go to Venta Socorro much. It was underneath the village on the road leading to Ronda and while there was a set of tables, watching the traffic was about the best you could do, though the views upwards across the hills were splendid - and it kept odd hours. It did though have the local cake shop adjacent and was on a good spot at the end of our afternoon walks round the village in searing heat. It wasn't always busy. As we approached one afternoon though things were different. On the first table, there was a well dressed old gent with a cup of coffee and a crossword. The next table was empty and we sat down, looking on with interest at the five or six workmen, dusky from the sun, but tinged white with cement and dust getting stuck into the booze. The old gent ignored us, but cheery "Holas" were shouted by the workers. They'd obviously had a few, but their drink of choice was gin and tonic. Now I like a gin, but we ordered tubos (33cl) and enjoyed looking on as the lads grew increasingly inebriated. As the conversation and banter flew back and forth a more gins went down red lane the drinkers grew more animated. The old gent didn't look up at all, he just carried on with his business. After we'd had a couple of beers the crossworder got up and with a cheery flick of his paper as a way of saying goodbye to all, he was off. We followed a few minutes later and as we climbed back into the village, we could still hear the shouted conversations of the gin drinkers below and round the corner.. While it may not have been beer, I reflected that really you could imagine a similar scene in almost any local pub back home. I didn't take a photo of the bar, but this painting by Jack McKenzie shows the place and is used in accordance with the terms on his blog. Cheers Jack. The coke bottle isn't there any more and the village behind has grown, but the scene remains essentially the same.